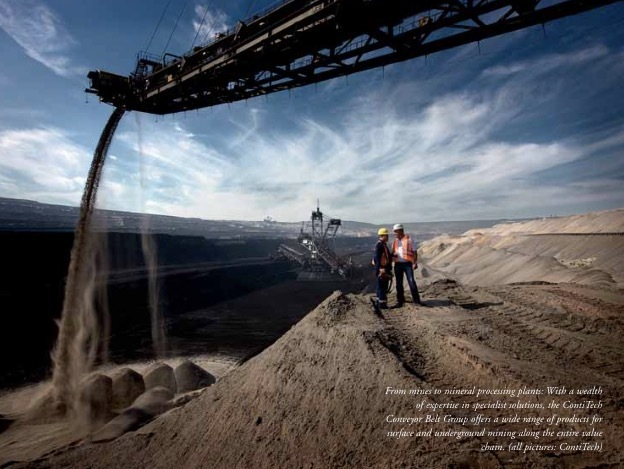 In mining and in many other industries, conveyor belts and systems by ContiTech offer a winning combination of quality and flexibility. Extensive expertise has made the ContiTech Conveyor Belt Group a leading development partner, manufacturer and system supplier of steel cord and fabric conveyor belts, service materials and special conveyor technology products. As well as offering worldwide installation and servicing, the company has around 8,300 employees working in development and production at 30 locations across the globe, e.g. in Australia, Brazil, Canada, Chile, China, Finland, Germany, Greece, Hungary, Morocco, Mexico, Serbia, Slovakia, South Africa, the United States and Venezuela. As part of the ContiTech division and consequently of Continental corporation, the Conveyor Belt Group benefits from expertise and potential synergies in an extremely wide range of industries. With a broad spectrum of conveyor belt products, ContiTech has the right solution for even the most complex of applications. Its comprehensive product portfolio is an excellent solution provider in under- and overground mining and is highly successful, thanks to intensive fundamental research and years of experience with a wide variety of conveyor belts. ContiTech’s R&D centres work tirelessly to develop technologies that meet the demands of today and tomorrow. For customers in a big number of non-mining industries, ContiTech is a single-source supplier with a comprehensive skills portfolio. From conveying and driving to filtering and guarding, its special purpose conveyor belts and solutions for machine and plant engineering perform a variety of tasks in various dimensions, often even simultaneously. As a specialist for conveyor belt systems, ContiTech offers a full service package for original equipment manufacturers and conveyor operators worldwide. Its production and sales sites across the globe strive continuously to improve customer- oriented processes and ensure every business partner continues to receive the same high standard of original equipment, quality and service expertise. From mines to mineral processing plants, the ContiTech Conveyor Belt Group has a wealth of expertise in specialist solutions and is consequently able to offer a wide range of products along the entire value chain. Its steel-cable and fabric- reinforced belts allow maximum conveying capacities, even under extreme climatic and topographic conditions. Used above and below ground, processing plants, and in various other industries, their robust construction guarantees high breaking load and good impact resistance. They also undergo only minimal elongation, even over longer distances — all thanks to ContiTech’s outstanding material expertise. One highlight of the product portfolio is the special bulk conveyor range. ContiTech’s Flexowell for example, is safe and cost-effective and guarantees efficient steep-angle transportation at up to 90°. A single belt can navigate horizontal as well as vertical routes without difficulty, and customers benefit from short installation times and low-noise, eco-friendly, energy-saving operations. Flexowell also forms the basis of Pocketlift, the vertical conveying solution. Pocketlift is capable of transporting up to 6,000 tonnes of material per hour over a maximum lift height of 700m per single conveyor. It can be modularly stacked to any height. The fabric-reinforced rubber pockets can be installed and removed individually, making Pocketlift much more compact than conventional systems, such as skip-hoists. This makes it ideal for handling materials in mining shafts. Pocketlift has been installed and tested successfully, for example at the American White County Coal (WCC) Mine in Carmi, Illinois. For enhanced safety, ContiTech has developed a series of innovative electronic conveyor belt warning and inspection systems that detect damage early and monitor the condition of conveyor belts. As well as meeting the highest standards, these systems can handle extreme conditions while at the same time guaranteeing a high degree of system security. Conti Protect warning systems, for example, make an important contribution to greater operational safety by preventing major damage to conveyor belt systems and so reducing damage-related idle times. Meanwhile, Conti Inspect systems supply the data required to make reliable service-life prognoses and estimate the ideal point in time for replacement investments more accurately. As well as keeping operating costs down, these systems help to protect the environment. As a development and service partner, ContiTech attaches great importance to good service. From initial planning and consultation to start-up and after-sales service, the company follows every order through to completion. Already during the planning phase ContiTech acts as a problem-solver, providing extensive expertise to support the right solution for individual conveying tasks and enabling customers to benefit from tailor- made solutions. ContiTech offers customers more than just conveyor belts: Service materials, such as pulley laggings, wear protection, repair and splicing materials and adhesives, are also part of the service offering. Over the years, demand for them has increased, and ContiTech’s broad product range provides improved, targeted service to meet customers’ needs. Thanks to the extensive range of service materials at its disposal, ContiTech can provide everything required to keep conveyor systems running. The product portfolio comprises service materials for optimum splicing, bonding, repairing and cleaning, as well as wear protection. Top quality ensures a long and reliable service life and above-average durability. One of the highlights in the product range is Conti Secur Premium, a single-component adhesive that’s safer, simpler and immediately ready to use. Because it does not need to be mixed with an activator, dosing errors are impossible. Conti Secur Premium is suitable for a variety of uses, such as bonding rubber to rubber and rubber to metal, and cold-bonding fabric-ply belts, as with Conti Secur BFA. Another advantage is that, like every ContiTech adhesive over the last 30+ years, Conti Secur Premium contains no trichloroethylene, which will be prohibited throughout the EU from April 2016.